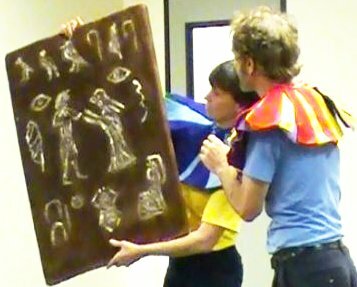 "The Egyptian Cinderella" is a story that has toured nationally several times. This page is for teachers to use to extend the learning experience after your school assembly. The script is available for school productions. The Egyptian Cinderella, considered to be the oldest of the many Cinderella stories, may be based on true events. It first appeared in written form in the First Century BCE, written by the Roman historian Strabo. The pharaoh Amasis II, who ruled from 570 to 526 BCE, was said to have married a Greek slave girl named Rhodopis, meaning rosy cheeks, who was said to have served with a slave named Aesop, the legendary teller of fables. As for the rest, who knows? Discuss: How is the Egyptian Cinderella story similar to the classic Cinderella story we've always heard? How is it different? Cinderella (The Oryx Multicultural Folktale Series) (The Oryx Press 1992) This book compares Cinderella stories from 25 cultures! At your local library 398.2 and j398.2 is where you will find more folktales from around the world. Listen to the The Rough-Skinned Girl Podcast by Act!vated Story Theatre players. Servant/Slave: what is the difference? The Egyptians had more than one system for writing. Hieroglyphics is the best known and perhaps the oldest, but it was used mainly for formal purposes such as inscriptions, as it was more picturesque and elaborate. Heiroglyph means "holy writing", because it was believed to be a gift from the gods. The symbols were both pictographic and phonetic; it was common to write a word such as "cat" by including both a picture of a cat and the symbols that spelled out the word for cat. The symbols were not necessarily written in a straight line, however, but could be arranged any way the writer pleased. Our interpretation of hieroglyphic writing. The two human figures in the middle are a couple getting married. The horseshoe shaped symbols on the bottom left are 10s. 2 of them plus the 1 = 21. Followed by a beatle. In the bottom right corner you will notice a Pharaoh sitting on his thrown. Therefore it reads "You must get married by your 21st birthday or else your daffy uncle will become Pharaoh", or so we like to think. Egyptians believed in more than 100 different gods. They also believed that the gods communicated to them with omens from animals or other things in nature. In the show the falcon is a symbol of the sun god Horus. Discuss: Why do the servants tease Rhodopis? Because she is different from them. She is from Greece and doesn't look like they do. They think they are better than her because she is a slave and although they are servants they get paid for their work. What is wrong with their behavior? How does Rhodopis deal with their bullying? What can we learn from it? Egypt and Greece are located not far from each other, just across the Mediterranean Sea, a major trade route for all kinds of cargo (including slaves). The capital of Egypt, where the Pharaoh lived, was called Memphis. It was located on the Nile River, not far from the Mediterranean Sea. Its ruins can now be viewed just outside the modern city of Cairo. In ancient Egypt the workers would often work in time to music in the field. What types of repetitive movements might they have used while working? Have the students demonstrate and experiment with movement. Notes from the Composer: To suggest the music of ancient Egypt, I composed the dance tune using what is sometimes called the Egyptian scale: C-D-Eb-F#-G-Ab-B-C. (This is only one scale to be called the Egyptian scale.) Additionally, I used modern instrument sounds that suggest some of the instruments that would have been used: the oboe, the harp, the tambourine and the trumpet. The Egyptians played a double-barreled reed instrument called the zummara that might have sounded somewhat like the modern oboe or clarinet. 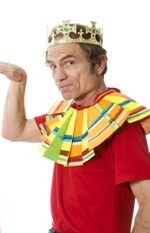 Have your class put on their own version of the Egyptian Cinderella play using the script by our award winning playwright. What was the falcon puppet made out of? An old boot and a feather duster. Does this give you any ideas about how to use common objects to create something new? What could you use to make a puppet out of?